SANTA FE, NEW MEXICO (ANS – Jan. 5, 2016) — At a recent Epiphany handbell concert at the Cathedral Basilica of St. Francis in Santa Fe, New Mexico, I was reminded of the power of a simple sound, a poignant prompt that praise is more than a parade of words; it can be heard in the ringing of bells. According to Willard Markey, Robert and William Cor developed tuned handbells in England between 1696 and 1724. The bells were originally used to produce musical, mathematically tuned patterns called change ringers. Later, the bells were incorporated in church services as a means to supplement the service with beautiful, sonorous tonalities. The handbell arrived in America in 1902 when Margaret Shurcliff brought a set of bells over from London. But the history of bell use within the church goes back even further. In the Old Testament, the Hebrew’s used bells in conjunction with the worship of God. In Exodus 28:35, the ringing of bells was encouraged as Aaron left the holy place. In Exodus 39:25, bells are made of pure gold, and incorporated within the worship service (see Exodus 28:33). In Zechariah 14:20, the bells had inscribed on them, “Holy to the Lord.” Bells reminded people of God’s presence. Within the Christian community, tradition holds that the use of bells dates to the 2nd and 3rd centuries, with Christians using them to call congregants to worship, something Romans did in a host of settings—political, religious, and social. Some historian’s attribute Paulinus of Nola (354-431 AD) as the first pastor to integrate bells in the church service. Paulinus was a poet, scholar, and statesman, so it’s fitting that he’s attributed with the introduction of the beauty of the bells. In 604 AD, Pope Sabiniaus authorized the official use of bells in church. From this point on, bells had an important and respected place in the worship service. Since the Middle Ages and Reformation, many churches used hand bells—called sacring bells—during the communion service, indicating Christ’s presence. And bells use today? According to S. Michael Houdmann, “The primary purpose of ringing church bells today is to signify the time for worshippers to gather for a church service. Many Anglican, Catholic and Lutheran churches also ring their bell tower bells three times a day (6:00 A.M., noon, and 6:00 P.M.), summoning the faithful to recite the Lord’s Prayer. This tradition was influenced by the Jewish practice of praying three times a day (see Psalm 55:17 and Daniel 6:10). The Catechism of the Catholic Church states that the Lord’s Prayer was prayed three times a day in the early church…”. Since the bells’ inception and use within Christian communities, composers have developed a marvelous repertoire of music in both Christian—and later—secular settings, encompassing a variety of ringing techniques—from the echo, gyro, and plucking, to shaking, swinging, and weaving. 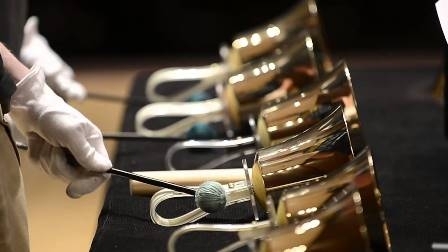 But for the church, handbells are much more than pretty instruments; they are portentous reminders of God’s presence, a practical means to express to us that God is with us in life. As a child I was introduced to the handbell choir, participating in the junior program at our Presbyterian church. I remember holding the bell—a C or D—if I remember correctly, trying my best to ring it on time and in the right place. I remember the music director patiently saying, “Ring it now,” as a group of kids bonged the bells in an assortment of places in the music, mostly off beat. We wore white gloves and were taught respect for the instrument (handbells can be very expensive). Something must have resonated with me. Years later, I began to collect bells—small and medium sized. I incorporated bells in the music I was writing, but mostly I just liked having them around, ringing them occasionally as a reminder of God’s presence in my life. I also gravitated towards music that incorporated bells—from the composers of the past, Tchaikovsky, Mussorgsky, Ravel, Mahler, Rachmaninoff and Tosca, to living composer such as Arvo Part (who created a style of music based upon bell tones called tintinnabuli). So not only do bells remind us of God’s presence, they can be indicators of a search for answers—ringing probing questions about God, life, people, and the like—all as Arvo Part infers. In the poem, Donne reminds us—among several things—that all people will experience death, and the bell is a formidable reminder of life’s fragile nature, the pain of existence. For Donne, one person’s death can diminish life. And this leads me to the final, and most significant, symbol of the bell: the resurrection of Christ. Though the bell can remind us of God’s presence, of probing questions, and pain and death, it also reminds us of God’s promise of a future and a hope. “I grew up in the church, and I remember Easter Sunday mornings with great fondness. But our church had a bit of an inferiority complex in the little town I grew up in, because we didn’t have a bell tower. The Methodists had a bell tower, and they rang the bells every Sunday morning. I love the ringing of bells on Easter Sunday, or any Sunday morning, calling us to worship. “When Candy and I were in Germany on my sabbatical last fall, we worshipped with a family of Lutheran believers at a beautiful little medieval church. They had bells and a bell tower, and it was just glorious to hear the bells ringing. All around the world, millions of believers in every conceivable kind of building, with and without bell towers, gather together on Easter Sunday to celebrate this incredible victory. The supernatural, bodily resurrection of Jesus Christ is all about the victory over sin in our lives, over the guilt and shame that we carry around because we know we’re sinners, and over the greatest enemy that we’re all going to have to face: death. I love Goins words: God had a defined plan—Jesus, who provides us with a future and a hope. And bells can remind us of this truth. In a way, bells ring in response to death: Jesus is alive! And the only proper reply to realities such as this is, as Bob Dylan reminds us in his song by the same name, Ring Them Bells ! 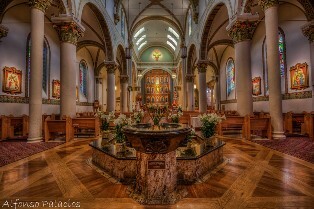 Photo captions: 1) St. Francis Cathedral in Santa Fe, New Mexico. 2) Church Bells. 3) Brian Nixon. Brian Nixon is a writer, musician, and minister. He’s a graduate of California State University, Stanislaus (BA) and is a Fellow at Oxford Graduate School (D.Phil.). As a published author, editor, radio host, recording artist, and visual artist, Brian spends his free time with his three children and wife, painting, writing music, reading, and visiting art museums. To learn more, click here: http://en.wikipedia.org/wiki/Brian_Nixon.